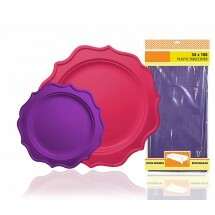 Add delightful color and style to your next party with the TigerChef Heavy Duty Purple and Pink Scalloped Rim Disposable Party Plates Set with Tablecoth. 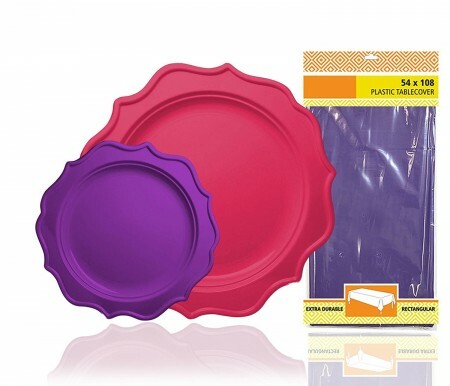 This high quality disposable plate set includes (24) 10-inch hot pink plates; (24) 8-inch purple plates; and a heavy duty 108" x 54" plastic purple tablecloth so you can effortlessly set an intriguing and festive table in no time at all. The hot pink and purple plates in this set are crafted from heavy duty plastic that won't break or sag during food service and they feature an enchanting scalloped rim design that is sure to enamour your guests. In addition, they are made from durable BPA-free plastic which can be resused, if desired, by simply handwashing after use. The plastic purple tablecloth, included, is also durable and perfectly matches the purple plates, eliminating any concern about mismatched party items. Complete your party with disposable cutlery, glassware and serveware, also available at TigerChef.com.